November 2018 Pig to Plate Adventure! 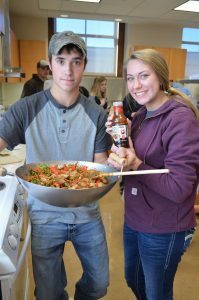 Thirty-six high school students from 10 different schools participated at the 2018 Pig to Plate Adventure held on the Iowa State University campus, and sponsored by the Iowa Pork Producers Association. Over the two-day event in mid-November, students interacted with industry and on-campus experts about the full pork story – from conception to consumption. This included a virtual tour of a gestation barn, a visit to the ISU meat lab, and spending time in McKay Hall kitchens, where the students prepared pork as part of a meal. “I think the students – from freshmen to seniors – really enjoyed seeing everything from conception to consumption. And being able to see it in that order really hit home,” said Kelsey Byrnes, the consumer outreach director at the Iowa Pork Producers Association. “Many of the students were really outside their element in the kitchen, but really loved it!” she said. Students came from schools in Nevada, Monticello, Shenandoah, Northeast (Goose Lake), English Valley, Belmond Klemme, Midland Community, IKM-Manning, Central Community, and Le Mars. Byrnes said she hopes to expand the opportunities for students in the fall of 2019. What is Pig to Plate Adventure? The Iowa Pork Producers Association hosts the ultimate pork industry experience for high school students in this fall event! The activities over two days include a commercial pig farm tour, a fabrication demonstration, a look into careers in the pork industry, a hands-on pork cookery class, and much more! Here’s the details from the 2018 event to help you review and plan when the 2019 Pig to Plate Adventure is announced – stay tuned! What: The two-day event will include a tour of a pig farm, a pig fabrication demonstration, hands-on pork cookery, and more! *We will be accepting up to 35 total attendees. We will allow each school district to send up to 5 students and one advisor. **We will cover the cost of up to 5 students and 1 advisor per school district. Questions? Contact Kelsey Byrnes at kbyrnes@iowapork.org or 515-225-7675.